1] Can I enroll my child during the school year? Typically no but some late enrollments are accepted on a case by case basis. 2] What are the pre-requisites? A form of prior consistent immersion is required for all our students wether through a relative, living in a French-speaking country or through part or full time immersion program or school. Our older students (7 and up) need basic to advanced level reading skills depending on the age. Upon pre-enrollment and for all new students, we schedule a pre-assessment session. Through some informal conversation and written activities, our experienced teachers will have a better understanding of the student's proficiency. Our goal is to evaluate the kids’ French proficiency and place them in the best level. 3] Can my child give it a try? We do not offer Trial Periods unless recommended by the Education Program Coordinator following the pre-assessment session. All terms are mutually agreed upon between EFGSeattle and the family of the student in advance of the school year. If the child is struggling too much in class, EFGS may consider withdrawal (parents will be advised to supplement the class with extra practice and/or tutoring before removal). 4] Can we schedule a visit? January through May, we organise some Open Houses. This is a great time to meet with our staff, visit our locations and observe briefly classes. If you missed the Open Houses but would like to schedule a visit, please contact us and we'll do our best to plan it. 5] Who are the teachers and assistants? Our teachers are chosen based on their teaching experience, quality of their native French, and ability to help students progress. They have a superlative command of French, like a francophone. Our assistants must have an excellent command of the French language and experience with children to assist our teachers. Some of them are teachers in training and part of our teaching substitute team. 6] What are the tuition fees? EFGS is a non-profit organization whose purpose is to provide French classes after school, at the most reasonable cost possible without sacrificing quality or jeopardizing its sustainability. Annual Cost may vary depending on enrollment and budget but we have been able to keep fees pretty stable. In 2018, the total cost for the 3-hour program varied between $1,850 and $2,100 depending on the time of enrollment. 7] What happens if I decide to withdraw my child from the program? If you decide to withdraw your child from our program, please email us. Pre-enrollment and tuition fees will NOT be refunded -- any tuition paid will not be refunded, and any tuition unpaid will still be owed. EFGS reserves the right to review any refund request on a case-by-case basis, but is under no obligation to do so. 8] What happens if you cancel a class? If EFGS has to cancel your child's class (due to low enrollment or any other unforeseen reason), you will receive a full refund (pre-enrollment & tuition fees). The pre-assessment fee is not refundable. 9] How is EFGS organized? EFGS is a non-profit organization managed by a group of volunteer parents (Board). Our staff is composed by a Director/Education Program Coordinator, an Assistant Director, an Administrative Assistant and the Education team (hired every year based on our needs). 10] As a parent, what is my commitment? Learning a language is an exciting adventure that requires over time a sustained investment from both the student and his/her parents. We recommend when possible to speak French at home, and to enjoy French whenever possible (games, books, magazines, movies. . . ), and to read bedtimes stories in French, to cook French recipes, ect... Hearing French in different situations outside the classroom will reinforce the lessons your child is learning and will help him or her understand that learning a foreign language is important to you. Before enrolling your child, we ask you to guarantee that you have every intention to make him/her attend classes on a regular basis and for the whole school year. 11] Will I have to volunteer? To stay true to our mission-- which is to provide an affordable and quality program -- our program is still very much dependent on volunteering. Fees cover our rental costs and materials, as well as the teachers’ salaries, but we also need everyone's time to help us. 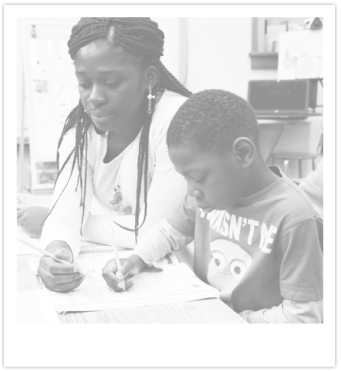 We're asking ALL families to volunteer the equivalent of one class/per child enrolled.